Dr. Mohammed Ayyash obtained his Jordanian Board in ENT, head & Neck surgery in year 1998 and Fellowship in Otolaryngology, Head & Neck Surgery from Royal Australian College of Surgeons. St. Vincent's Hospital, Sydney-Australia- 2004. Dr. Ayyash is a Senior Consultant Otolaryngology, Head & Neck surgery with more than 20 years of experience. He was Former Director of ENT, Head & Neck Oncology Service at King Hussein Cancer Center .Amman- Jordan. 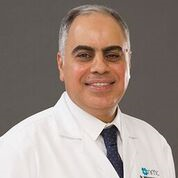 Dr. Mohammed Ayyash has special interest in major ENT, Head & Neck Oncology Surgeries mainly Total Laryngectomy with primary voice prosthesis restoration, Neck Dissection, Thyroidectomy, Parotidectomy, resection of all Head & Neck tumors with flap reconstruction, Nasal surgeries mainly Functional Endoscopic Sinus Surgery, Septoplasty, Turbinate surgery and Throat Surgery which includes Tonsillectomy, Adenoidectomy. Ear Surgery- Myringotomy with ventilation tube insertion, Tympanoplasty and mastoidectmy and all ENT Surgeries. Dr. Mohammed Ayyash can communicate with his patient in both Arabic and English.